The Winkbed Plus is the latest from American-made mattress retailer WinkBed and is designed with the heavier sleeper in mind. To this end, the bed’s outfitted with a hybrid design meant to maximize pressure relief and body support without sacrificing comfort. Today, I put this mattress to the test to see how comfortable it actually is and to figure out if it lives up to its goal of being the go-to mattress for the heavier sleeper. 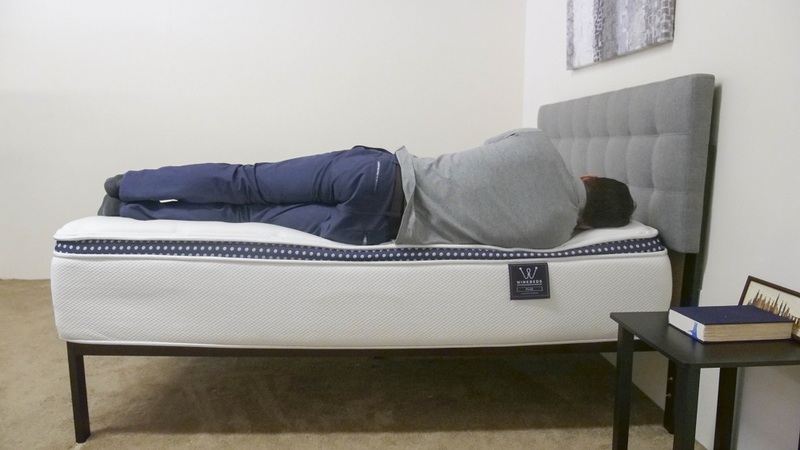 Continue reading below for my full review of the WinkBed Plus mattress. Don’t have time to read it all? Click here to skip to the bottom and check out my review summary. As I mentioned up top, the WinkBed Plus is constructed with a hybrid design that incorporates foam and pocketed coil components. The use of different materials is meant to imbue the mattress with both soothing pressure relief and excellent support, two things heavier sleepers don’t always get from other beds. To see just how well these parts play with one another, let’s dive into the mattress and take a peek at its different layers. Cover/Comfort Layer – The cover is made of a soft fabric blended with Tencel, a plant-based material known for its moisture wicking and cooling properties. 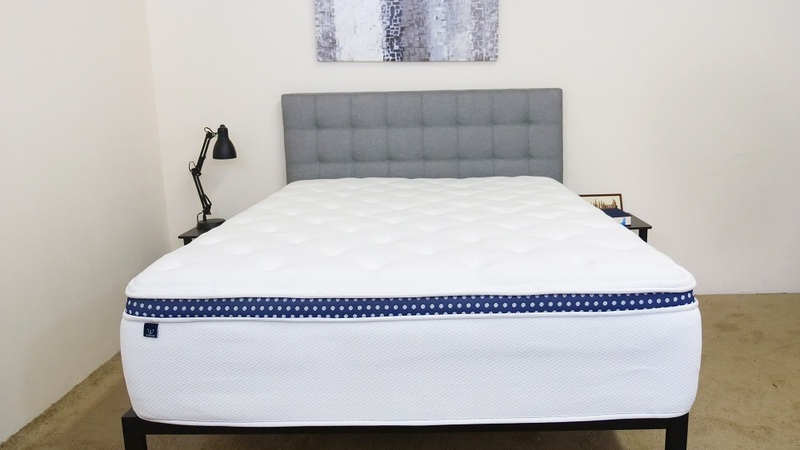 It’s also quilted with polyfoam, which provides immediate comfort and helps defend against any impressions that might form on the mattress over time. 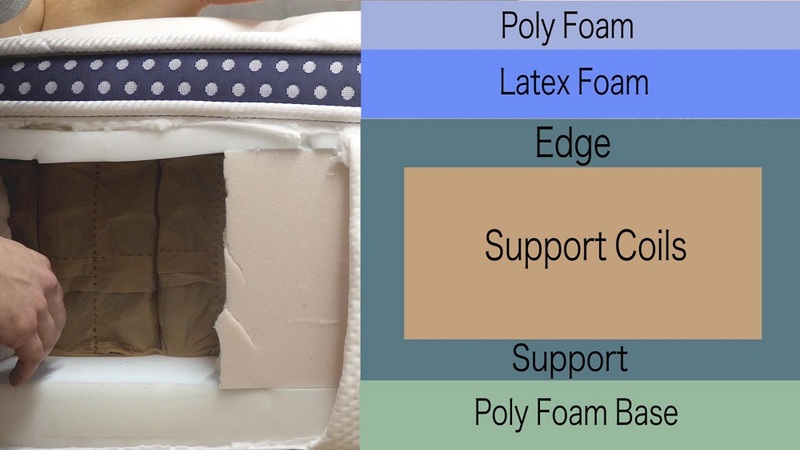 Bounce Layer – Below the top layer, you’ll find 2.5” of latex foam. This section has a quick response to pressure, ensuring that you’ll never feel stuck in the mattress and will be able to move around easily. Latex is also great at cooling, so it in tandem with the Tencel in the cover will keep things from getting too hot. Support Layer – The support layer of the mattress is built with a pocketed system of individually wrapped coils. These springs give the bed some awesome bounce and work to lift the sleeper up and out of the mattress. Pocketed coils are especially good at isolating motion, so they’ll help to control and disperse movement evenly. Plus, the space between the coils allows for some killer air flow throughout the bed. Edge Support – The WinkBed Plus also features a layer of high-density polyfoam edge support, which surrounds the coils and offers additional structure to the mattress. WinkBed Plus v. the original WinkBed – The biggest difference to note between the plus and the original is the use of latex foam. The original WinkBed gets its bounce from two separate sections of pocketed coils while the plus employs a durable layer of latex directly below the cover to offer some immediate lift to the sleeper. This change is an important one for heavier sleepers, who don’t always get quality support from the top layers of their mattresses. After taking a look at the construction of the WinkBed Plus, let’s chat about the firmness and feel. I started off by applying light hand pressure to the mattress and experienced the pleasant sinkage of the quilted foam cover. Before sinking in too much, I encountered the buoyant latex and pocketed coil layers, which lifted me up and out of the bed. At this point I’d like to note that people of different body types and shapes will feel firmness differently. 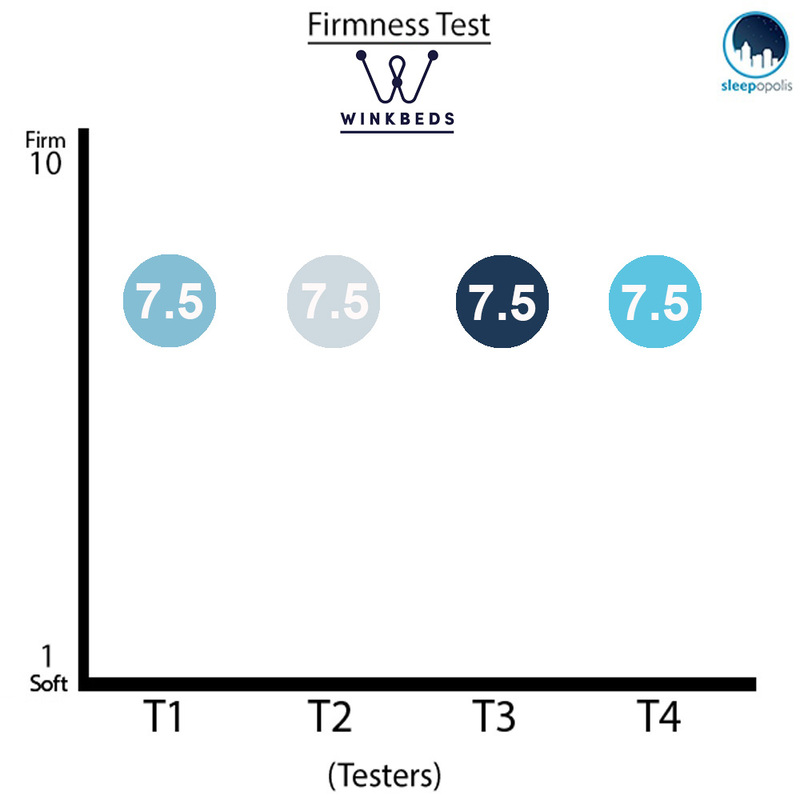 Rather than giving just my opinion on the overall firmness level of the WinkBed Plus, I enlisted three other people to give their opinion as well. This will give you a better sense of the firmness range you can expect from the mattress. As you can see in the graph above, all of my testers were in agreement about the firmness of this mattress, giving it an average rating of 7.5. When compared to the industry standard of 6.5 for medium firmness, it’s pretty clear that this bed is quite firm. I should note that the bed was actually designed to have a medium firmness for sleepers who weigh over 300 lbs. If you weigh less than that—as all my testers did—you’ll likely find the bed pretty hard. That being said, this extra firmness is great for back and stomach sleepers of all sizes who will benefit from the bed’s added support. Rather than just describing the feel of the WinkBed Plus to you, I wanted to give a visual representation of where someone may feel pressure points form while lying on it. To do this, I placed a pressure map on top of the mattress and lied on my back, side, and stomach. You can see the results on the image below where pressure is represented from blue (low pressure) to red (high pressure). Back – Lying on my back, I felt comfortable and well-supported. The quilted cover did a great job at filling in the spaces in my lumbar region and the coils helped to make me feel like I was sleeping on top of the mattress as opposed to in it. Side – Rolling onto my side, I felt some pressure begin to form at my shoulders and hips. Given the mattress’ relative firmness, I’m not surprised that I felt a little strain in this position as most side sleepers prefer softer beds. Stomach – Transitioning to my stomach, I didn’t feel any pressure at my chest or hips and noticed that my back was in a nice alignment. The supportive latex layer made it easy to move between all of these positions and helped me to never feel stuck in the mattress. Check out my picks for Best Mattress for Heavy People! 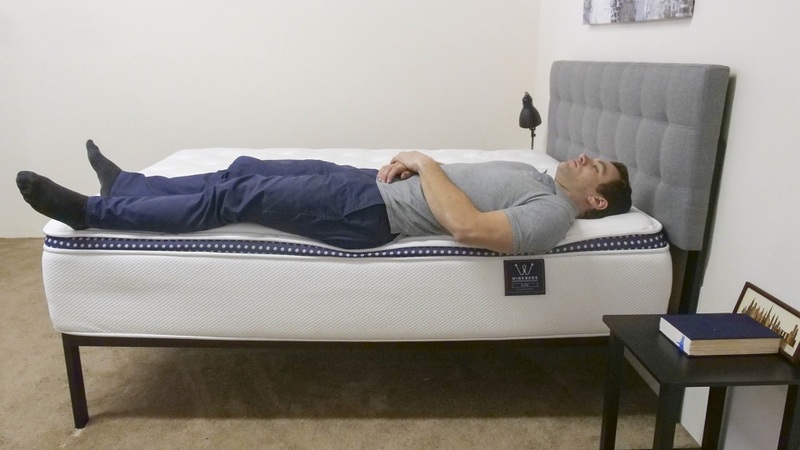 The WinkBed Plus shows an average amount of disturbance for the 4 inch drop, which simulates someone rolling around and adjusting their position on the other side of the bed. 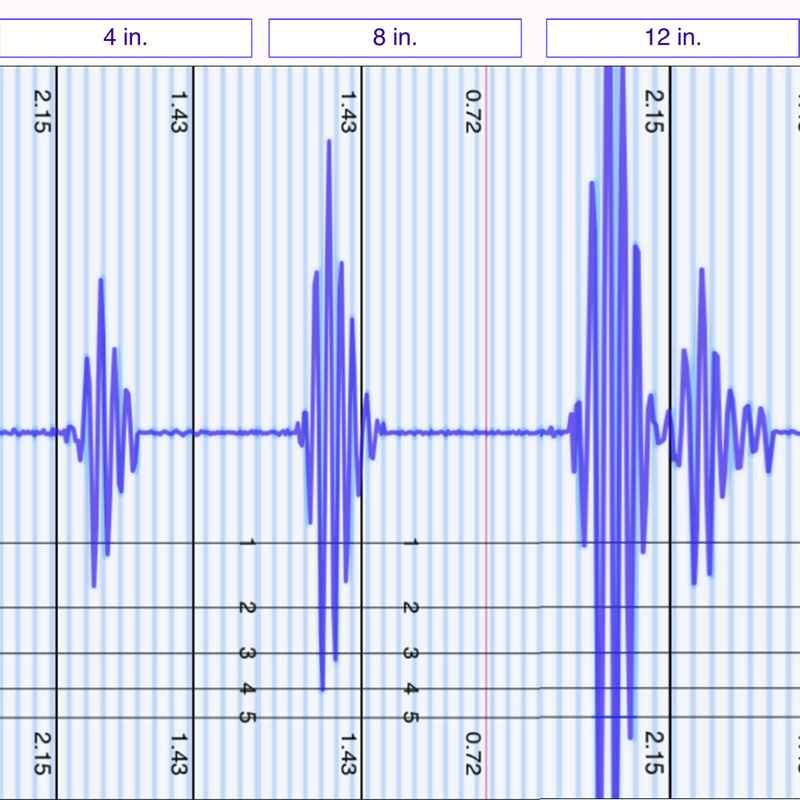 As you can see in the graphic above, the mattress experienced quite dramatic spikes in movement at both the 8 inch and 12 inch drops, which tells me this mattress isn’t the best at isolating motion. While the individually wrapped coils do dissipate some of this interference, it’s likely that you’ll feel your partner moving around at night, a compromise that may be worth it in exchange for such a supportive mattress of this type. When buying a new bed, most people want to know whether they’ll feel like they’re sinking “into” the mattress or laying “on top” of it. This can be especially important for heavier sleepers, who sometimes struggle to feel supported by softer foam beds. I’m guessing the buoyant layers in the WinkBed Plus will work to counteract any uncomfortable sinkage and will keep the sleeper from feeling too stuck in the mattress. 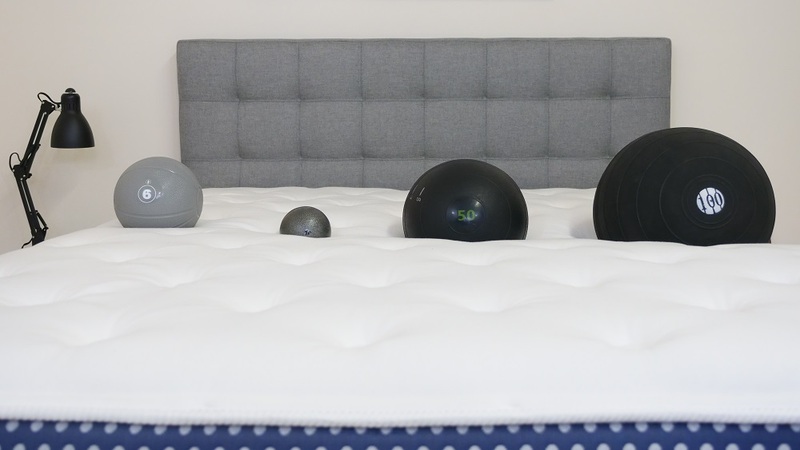 To test this, I placed four balls of varying sizes and densities (a 6 lb medicine ball, a 10 lb steel ball, a 50 lb medicine ball, and a 100 lb medicine ball) on the bed and measured how much they compressed the surface. 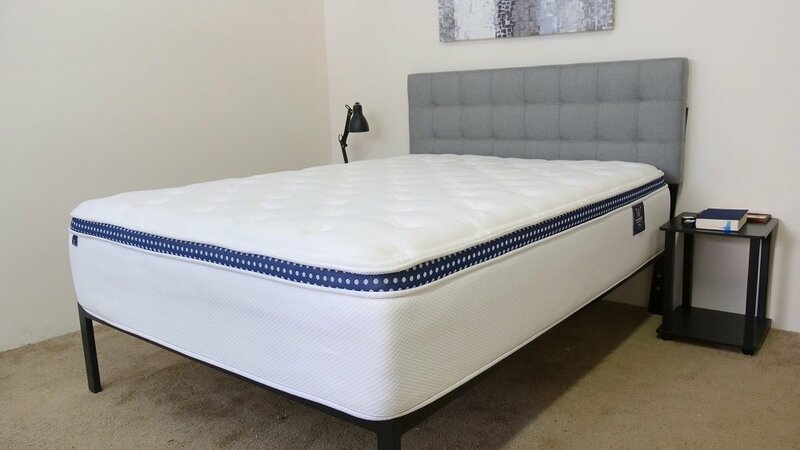 While you’ll likely experience some sinkage from the quilted foam cover, the latex foam and pocketed innerspring system do a great job of supporting the sleeper and keeping them on top of the mattress. This is excellent for back and stomach sleepers who benefit from a bit of bounce and lift from their mattresses. Lying on my back near the edge of the mattress, I felt very even support. I was secure at the side and didn’t feel like I’d roll out of the bed. Rolling onto my side, I experienced some light compression from the soft quilted foam cover, but nothing that made me feel unstable. In this position, I wanted to simulate what it would feel like to be sitting on the bed in the morning when you’re lacing up your shoes and getting ready for the day. A lot of mattresses with foam components experience severe compression in this position, but the WinkBed Plus actually held up pretty well. To give you a better sense of what sets the WinkBed Plus apart from the original WinkBed, I’m going to summarize some of the key variations. Construction – One of the biggest differences between the WinkBed Plus and the flagship model is its use of latex foam up top. This material responds quickly to pressure and provides some extra lift, a quality important for heavier sleepers who will benefit from the immediate support. Feel – This support is also felt in the WinkBed Plus’ firmness. Given that the bed is designed for sleepers over 300 lbs., it makes sense that it would feel “harder” than the original WinkBed. That being said, this hardness is relative as sleepers of different sizes obviously experience firmness differently. If you’re convinced the WinkBed Plus is the right mattress for you, be sure to use the code SLEEPOPOLIS60 to save $60 on your mattress purchase. 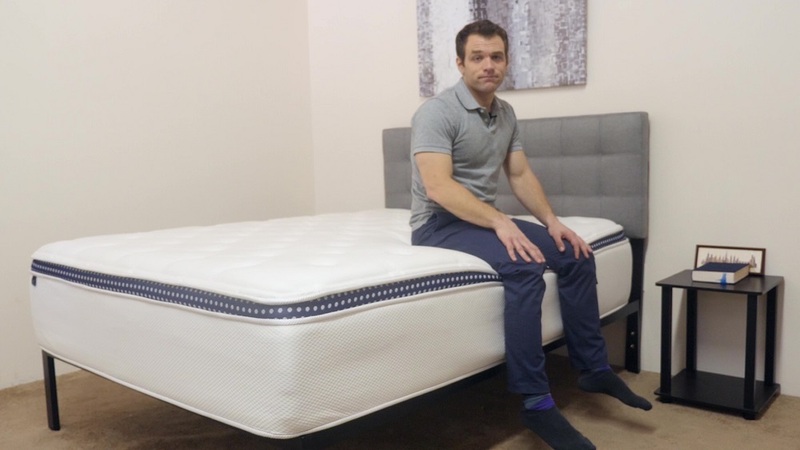 IS THE WINKBED PLUS MATTRESS RIGHT FOR YOU? Now that we’ve taken a closer look at the WinkBed Plus mattress, it’s time to discuss who it’d be a good fit for. Heavier sleepers – With its use of durable foam and highly supportive pocketed coils, the WinkBed Plus is specifically designed for sleepers that weigh over 300 lbs. It’d make a great bed for heavier folks disappointed with other options on the market. Looking for bounce – I’d also recommend this mattress for anyone in need of serious bounce. The latex foam and coil system work together to bring some buoyancy to the bed, allowing sleepers to shift positions easily in the night. Want to sleep cool – There are a lot of components in this mattress that work to create a cool sleeping experience, namely the latex and individually wrapped coils. These materials encourage air flow throughout the bed and prevent the sleeper from overheating. For more information on the WinkBed Plus, check it out here! 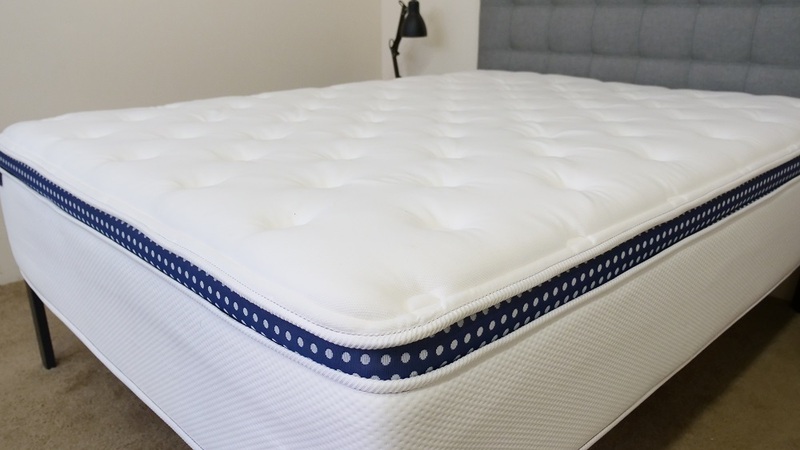 The post WinkBed Plus Mattress Review appeared first on Sleepopolis.